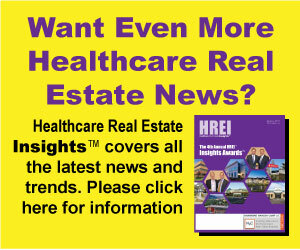 Healthcare Real Estate Capital (“HRE Capital”), as advisor to the transaction, is pleased to announce the disposition of a seven building, 364,560 square foot medical office building portfolio (“Portfolio”) located throughout Florida and Indiana. The 98% leased Portfolio has a weighted average age of less than eight years and included tenancy by national health systems, regional hospitals and multi-specialty physician practices. Through relationships with both Healthcare Trust of America (“HTA”) and The Greenfield Group (“TGG”) and its unmatched knowledge of national medical office transaction structuring, HRE Capital was able to facilitate the discussions and assist in negotiating the sale of this Portfolio. The mutually beneficial transaction was structured to meet both the buyers and sellers specific goals and implemented in a restrictive, 30 day time frame. HTA is a publicly traded real estate investment trust (NYSE: HTA) and one of the largest owners of healthcare real estate in the United States. Since its formation in 2006, HTA has invested over $2.8 billion in capital, creating a portfolio of primarily medical office buildings totaling over 13.6 million square feet across 27 states. TGG has been exclusively focused on healthcare real estate for over 20 years and is committed to providing healthcare professionals with well-planned, efficient and cost effective medical real estate. With over two million square feet of healthcare real estate development and management experience, TGG maintains a Florida focused full-service development and operating platform.